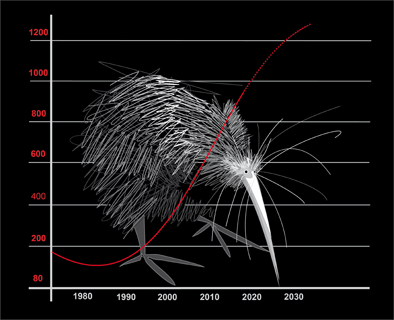 Ross hatched in “The Knight’s” nest at Riponui in September 2014 and was 300g in weight when transferred to the Limestone Island kiwi crèche 10 days later. He made himself at home on Limestone until we caught up with him spotlighting one night in February 2018, by then he was 3 and half years old and almost fully grown at 2425g in weight. Ross starred at our community Backyard Kiwi release at the Parua Bay sports centre March 11 2018. 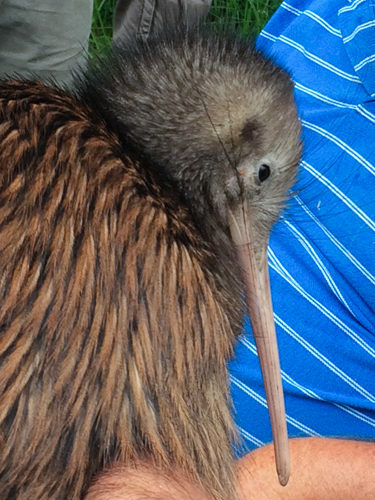 Not only did he win the hearts of the locals he was also filmed as part of a Backyard Kiwi video about the release. He has been named in recognition of the Ross family who gifted the community the use of the land a Parua Bay for our Community and sports centre there. Inland from Solomon’s point, at the top end of Pepi road. 11 hours nightly activity. Inland from Solomon’s point, at the top end of Pepi road. 10 hours nightly activity. Inland from Solomon’s point, but now at the top end of Pepi road. 10 hours nightly activity. Inland from Solomon’s point, but now at the top end of Pepi road. 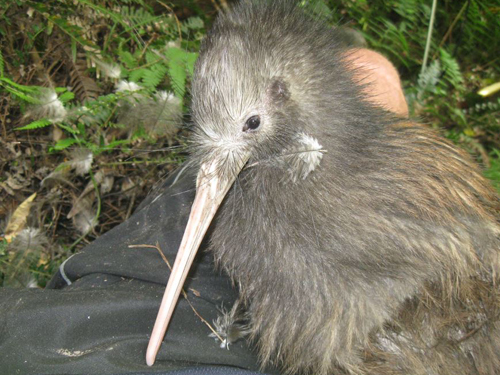 Locals at Pepi Road and Te Rongo Road are hearing him or another male kiwi call – still no female yet. A pair of kiwi are regularly heard slightly further north at Franklin Road so all the hard work of the Kiwi Link groups just north of us is paying off. He has now spent the last 5 months in the area just inland from Solomon’s point, opposite the boat ramp, his activity is still high – 11 hours per night. He has spent the last 4 months in the area just inland from Solomon’s point, opposite the boat ramp – activity still high – 13 hours per night. He has spent the last 3 months in the area just inland from Solomon’s point, opposite the boat ramp- activity still high – 13 hours per night. He has spent the last 10 weeks in the area just inland from Solomon’s point, opposite the boat ramp – seems pretty settled. In the dense privet stand inland from Solomon’s point. He has been there for over a month now so hope that he has found some kiwi company. After going south, then east he has now headed west! He spent a week or so in the Kohinui Valley (exciting for the Kohinui Landcare group!) and is now in the dense privet stand inland from Solomon’s point. Folks have been hearing him call near Pepi road. West of Owhiwa road in the Kohinui Valley Landcare area – exciting for them! I checked his transmitter band and gave him a quick health check – all good! He is now 2100g after all his walking. His wanderings are proving to lots of locals that there are kiwi here and they are are loving having him in their backyard. He has turned up at Owhiwa Road – 3 km to the west. I lost his signal for a few weeks! 8th- He has headed east and is near the bridge on the Pataua south road. 4th- Ross has moved back towards the Parua Bay village and has settled opposite Darwin at Lamb Road- possibly for another calling competition! 23rd- Has made his way down Taraunui road towards Ross road. Exciting stuff for the locals here- he is being heard calling in the evenings. 17th-He has crossed back across the creek and moved north to Ross’s bush block- possibly for a calling competition with local kiwi Darwin, who is nearby at the moment. 16th-Ross has crossed the creek at Lamb road and is in the roadside pampas there. 13th-He has safely settled into the bush block at the Ross property behind the rugby field.